My boyfriend and I had been considering purchasing a new blender. We ventured to Bed Bath and Beyond to take a look at the selection. We knew we didn’t want to spend the money on a Vitamix, but understood it was one of the best blenders out there. 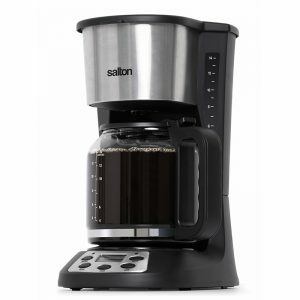 To our surprise, when we talked in, there was a really nice sales associate for Salton named Delinie! She had this pretty cool retro looking blender with berries, a full apple (core in) bananas etc. We asked if she could show us how it worked and OMG was it impressive! It blended the entire mixture in under 2 minutes and it tasted delicious. 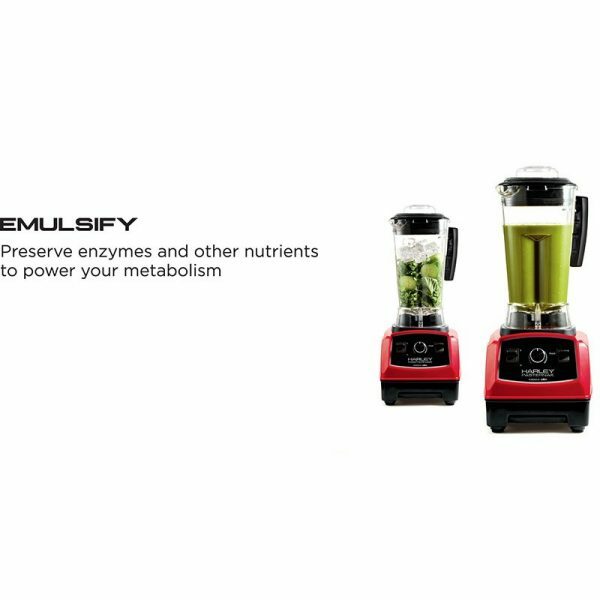 We immediately fell in love and had to purchase one; for a fraction of the price, we got an equivalent blender that in my opinion, looks better and is extremely powerful! I would recommend this blender to anyone! Not to mention, the associate Delinie is absolutely amazing and has been so helpful in helping us with recipes and further instructions. 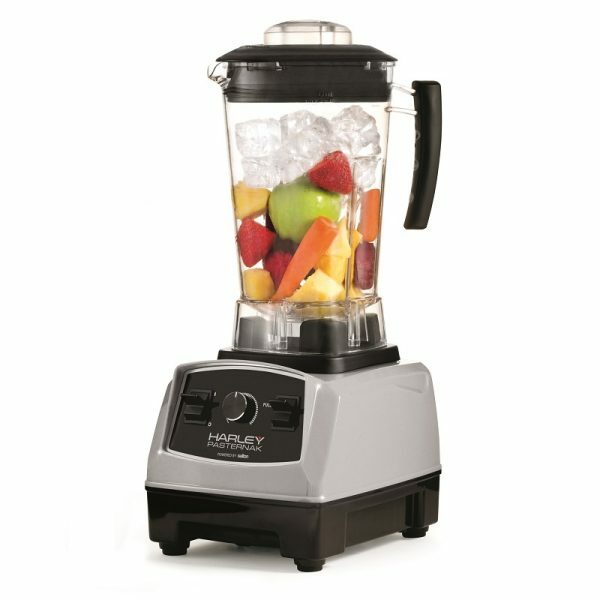 I have been reading reviews for the H Pasternak Blender as i just purchased one but wasn’t sure if it was going to crush the apples and whole fruit such as oranges and veggies. I was glad to hear that you were pleased with yours and wanted to check to see if in fact you have continued to like it and it is ok to throw them in whole. i.e. whole apples? You mentioned the sales girl was awesome and I do like B. Bath and Beyond for their customer service for sure. They are fantastic. Was there a site to find more recipes for the blender that the girl had passed onto you? Thanks for your time and hope you don’t mind that I replied to your review. It was very helpful as I was a bit doubtful. 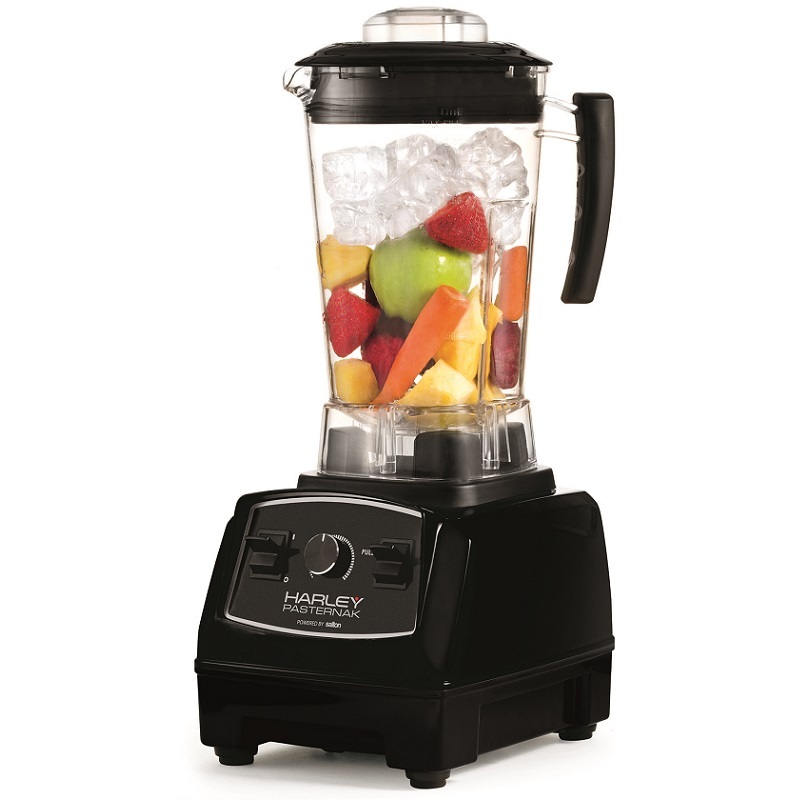 This is the best blender I have ever used. Blends well and fairly quickly. Easy to clean. Love it so much I’m getting a second one for my cottage. I have used this blender for the last 6 months, and truly impressed with the power and the quality of its performance. It feels solid and seems to work extremely well regardless of whatever you throw at it..! 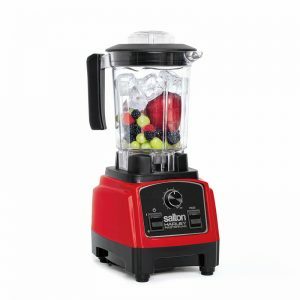 I would highly recommend this blender to anyone who’s looking for a well-built, quality machine with a reasonable price, especially in comparison to high-priced blenders, such as Vita Mix.. I wanted a new blender to make smoothies and ended up buying the magic bullet which was small and weak. I then bought the ninja, and again the experience was the same, too small and weak. 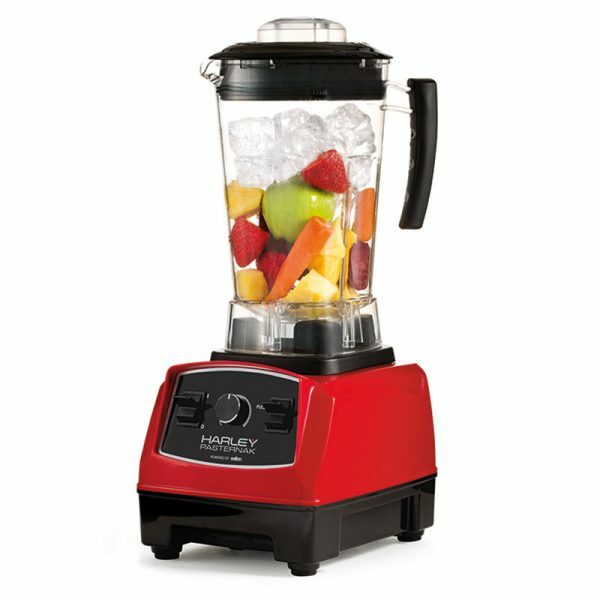 When I got the Harley Pasternak blender I was very happy, the power is great and the size is perfect. 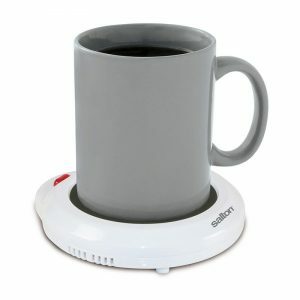 I use this everyday to make smoothies or soup. My family liked it so much that 4 of them went out to buy one for themselves. 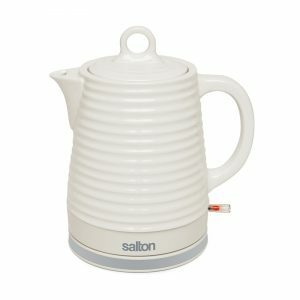 The next time I am looking for a small appliance, I will try Salton first. I’ve manage to break about three blenders over the last few years. So it when it was time to look for another blender i needed one that was well built and reliable. This blender is exactly that. I’ve been using it for a few weeks, and I’m amazed of the results from smoothies to soup, yes soup in a blender. 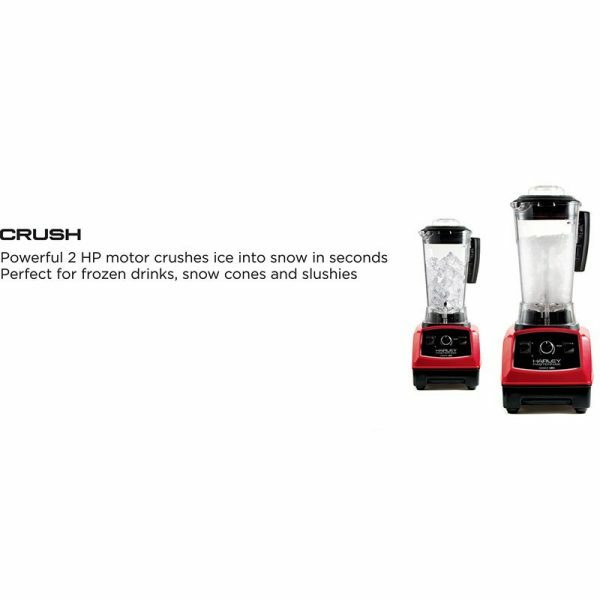 It pulverizes anything you put in there , whether fresh or frozen. The best part is the ease of cleaning it, no need to take apart 4 to 5 pieces. If you want a blender that gets the job done without the $500 price tag this is the one. I highly recommend it! 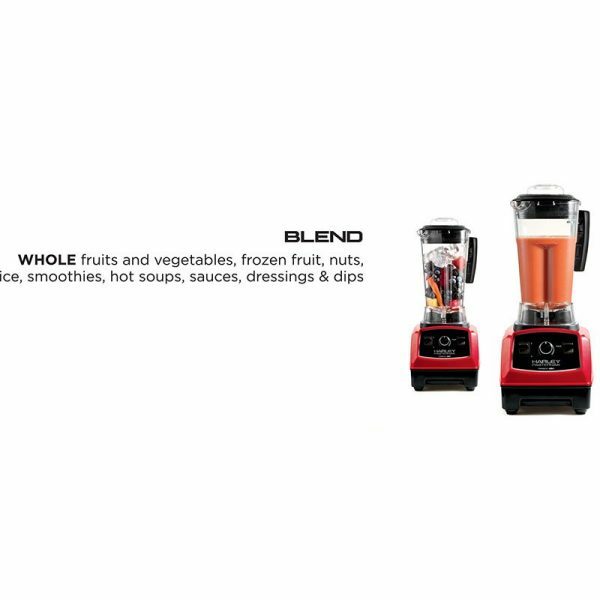 I’ve had low to mid price blenders my whole life, and finally bought this one in the hope that it would make all of my problems go away. It did. I literally can’t think of a single thing to complain about. 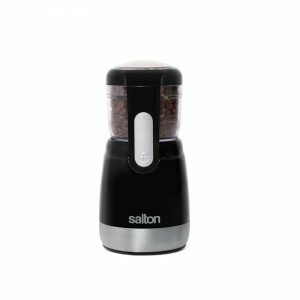 I wasn’t going to pay $400 for a blender, and after trawling the reviews extensively, it appeared that this one punches way above its price. Every issue I have ever had with a blender (and there have been many) has resolutely failed to appear with this gem of a machine. 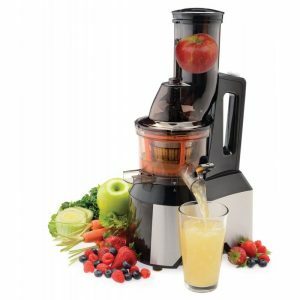 It regularly whips multiple whole apples, carrots, and anything else I’ve thrown at it into smoothies without any issues at all. Cleaning it’s a breeze. I expected the jug to be difficult since I don’t like to use my dishwasher (I’m very eco-friendly), but was surprised to find it easier and quicker to hand wash than normal jugs, as there are no cracks and crannies to get full of blended food. All around awesome blender! I needed to replace my 15yr old Vitamix due to motor issues. My two choices were to have the base refurbished by the manufacturer at cost of +-$200(CAD) or buy another blender. I found a great deal on the HPPB at Home Hardware for the same price to fix the Vitamix and went for it. I’m very impressed with the new blender as it performs equally as well as my old one ever did. As an added bonus, the containers from my old blender are compatible with the new base! We wanted a Vitamix, but could not justify the cost. 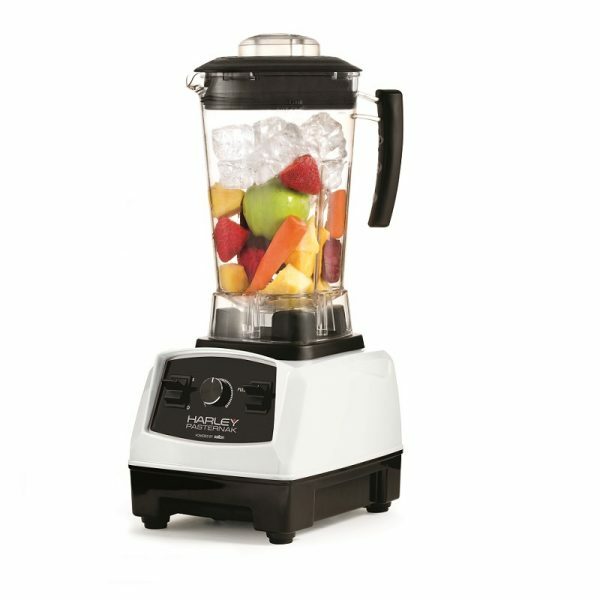 We came across the Harley Pasternak Power Blender at our local Canadian Tire, and started to look into it. At the time, we couldn’t find many reviews, but all had the same message of great price for an even better product. Right out of the box, this looks great. Thick rubber lid, jar does not feel cheap, and metal-on-metal parts. Base is plastic, but feels sturdy as do the controls. 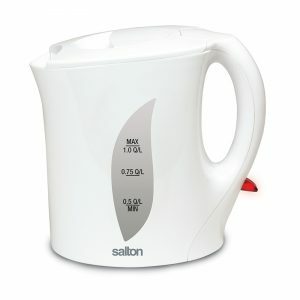 The first time we used it, we knew this would become a new staple in our kitchen, and have used it everyday so far. Pulverizes all ingredients. Thanks for great savings and smoothies. 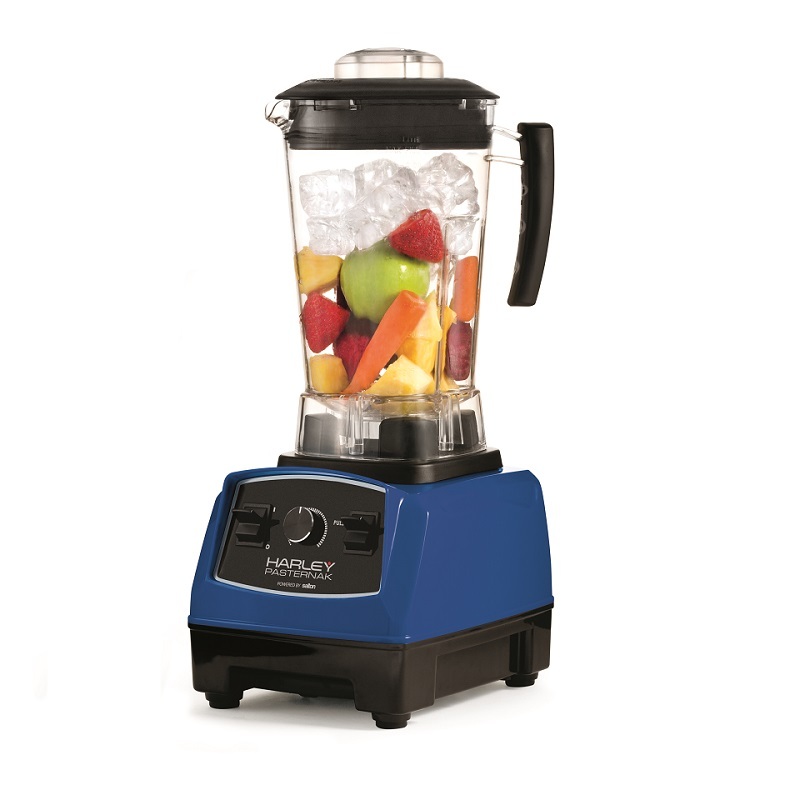 The Harley Pasternak blender is pure high performance for an affordable price. I have had mine for 3 years and have never been disappointed. The Smoothy test did it for me, absolutely silky smooth results every time. 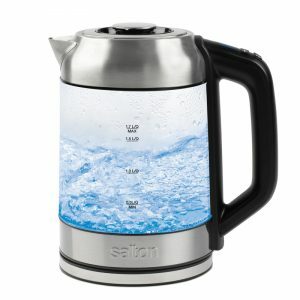 Enjoy your teatime with the coolest kettle on the market! 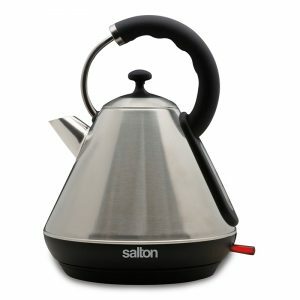 This Retro Pyramid Kettle boasts a sleek, classic design that will accent any kitchen. 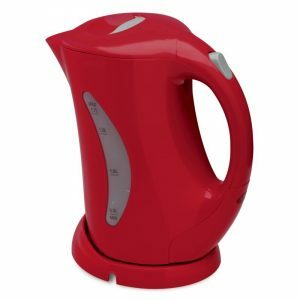 This cordless kettle has a convenient 360° base which is perfect for both right and left hand use. 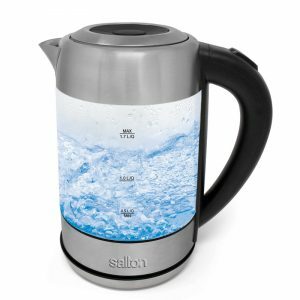 Designed with a spout and handle that ensures a perfect pour every time – no spills caused by leaky spouts! 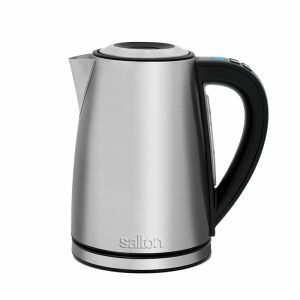 The auto ‘boil and off’ switch shuts the kettle off when the water starts boiling, giving you the freedom to move around and not be glued its side. 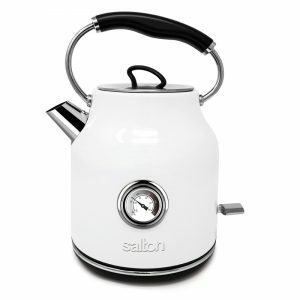 The handy cord wrap eliminates clutter, letting the elegant kettle add to the ambiance without the mess. Available in brushed stainless steel and Red Metallic. 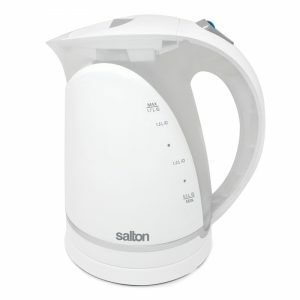 With a powerful 200-watt motor, LCD display and 10 speed settings the Salton Digital Hand Mixer can handle almost any mixing task; from kneading dough to whipping egg whites. 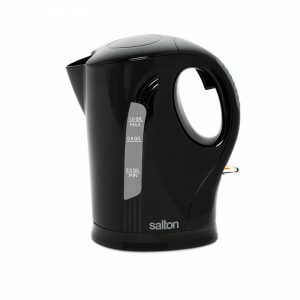 A comfortable handle with easy to reach buttons and a convenient flat heel to rest on the counter are all wrapped in an innovative, sleek design. 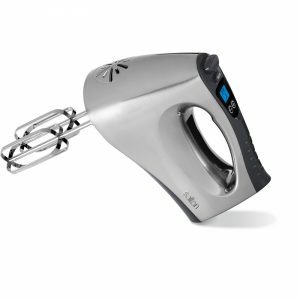 Dough hooks and beaters are easily removed by the ejection button on the handle. Includes two chrome beaters and dough hooks. 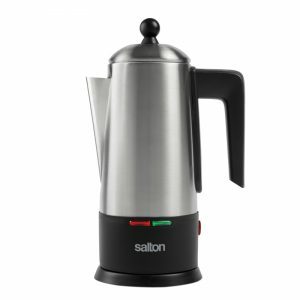 Grind coffee beans, herbs and spices easily with the Salton Coffee, Herb and Spice Grinder! The high speed, stainless steel blade grinds beans, spices and herbs quickly and the pulse function allows you to control how coarse or fine you grind your ingredients. 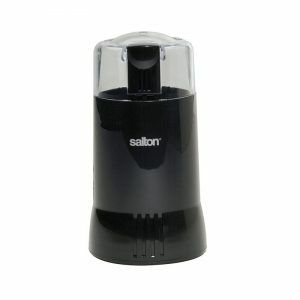 This innovative grinder can be operated with one hand and features a removable bowl that is dishwasher safe. 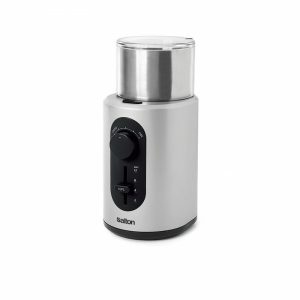 It also has a built in safety feature that prevents the grinder from operating without a lid. Spice up your kitchen and your cooking! No more need to chop before you juice! 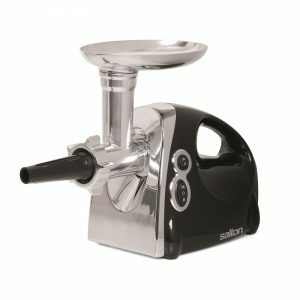 The Salton Wide Mouth Low Speed Juicer can accommodate whole fruits and vegetables, eliminating the prep work. 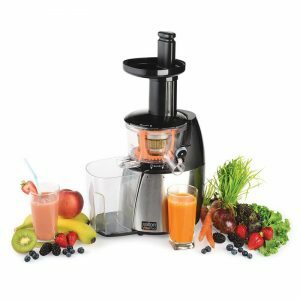 The superior cold press technology and studded auger ensures more juice is squeezed from the fruits and vegetables producing nutrient rich juice without the added preservatives. Simply change the strainer and you can create fresh or frozen fruit smoothies, or even turn your frozen fruit into soft serve ice cream. 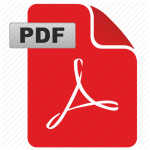 Includes 3 strainers (juice, smoothies, and frozen desserts) and a color recipe booklet. Add a little light to your water with the vibrant blue illumination feature. 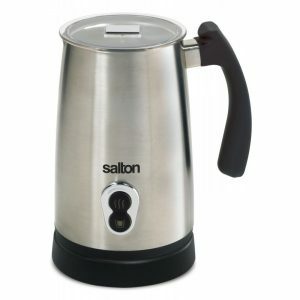 The Salton Cordless Electric Glass Kettle is faster than a microwave and safer than a stove top. 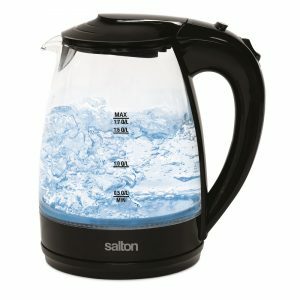 Convenient markings on each side of the kettle help you measure the water inside. The concealed element inside permits fast and easy cleaning and the 360° design of the base allows for right and left hand use. The handy cord wrap will eliminate clutter from your counter and the sleek design will illuminate the look of your kitchen. 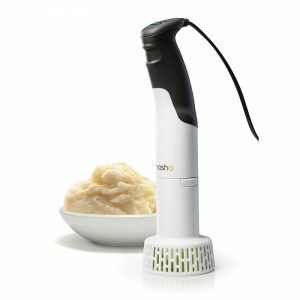 This hand blender is perfect for dips, sauces, soups, baby food, milkshakes and more! 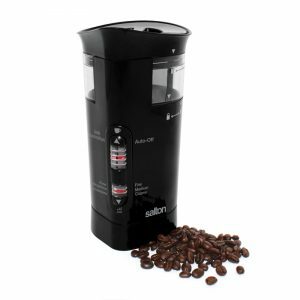 With a one-touch operation, variable speed control and a powerful 350 watt motor, just immerse the unit into your bowl/container and away you go! 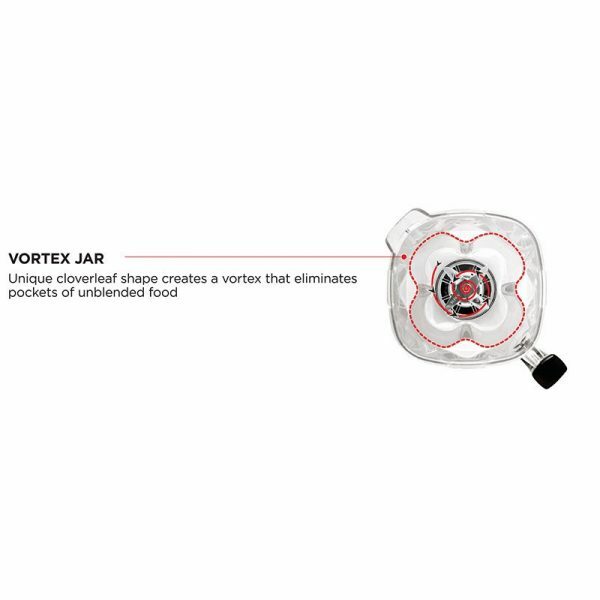 This innovative blender includes a smoothie attachment so you can make your favorite blend directly in the bottle. 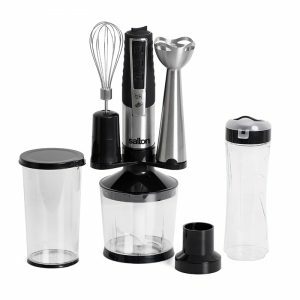 Set includes the blender, whisk attachment, a 16oz / 600ml measuring cup, a 16oz / 500ml chopper, smoothie attachment, smoothie bottle and a storage bracket. 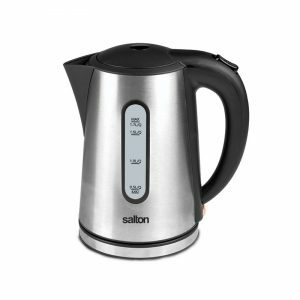 A small kettle with a lot of kick! 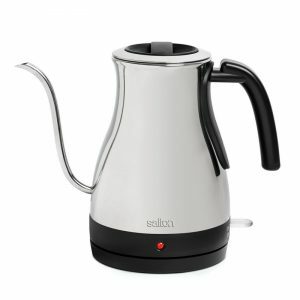 This small kettle can boil as little as 2 cups and automatically shuts off when it’s done. It’s safer than a stove top and faster than a microwave. Want just one cup of tea? 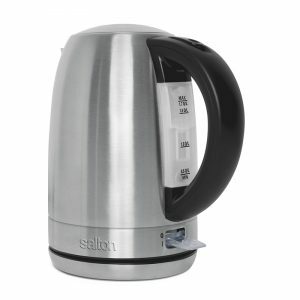 This is the kettle for you. 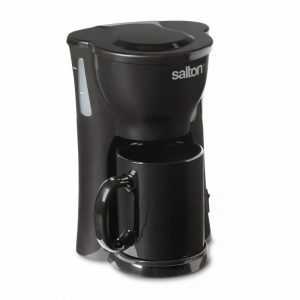 Grind coffee beans, herbs and spices with the Salton Coffee and Spice Grinder. The high speed stainless steel blades grind beans, spices and herbs quickly and the pulse function allows you to control how coarse or fine you grind your ingredients.